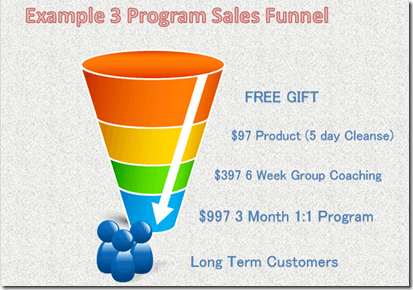 Do You Have a Real Marketing System For Your Coaching Business? Most of the health coaches I have been speaking with lately seem to be getting really stuck on how to create a marketing system that leads to a steady stream of clients and income. Over the course of the next couple of weeks I am going to write about setting up systems to help make this more of a reality for you. Today I’m going to start off with talking about the idea of a sales funnel and why the technique you were likely taught in school is missing many pieces of the puzzle. In follow-up articles, I will dive a little deeper into various steps of the process. Sound good? Great, let’s get started then. When I went to school to become a health coach I was taught a VERY basic marketing model. Get out there and give public talks, offer free consultations and then enroll people into a 6-month coaching program. While this is a valid model, it really leaves a lot of steps out if you want to be successful. First off, most people are not ready to invest $1,000 –$2,000 with you right after they meet you and hear about your program. So let’s just do a little math exercise. Let’s say that you give a few public talks over the course of a month and speak to 100 people total. Of these 100 people, you manage to get 20 free consultations booked and this turns into 2 clients. Supposing you make $1,500 for your 6-month program, this would be $3,000. 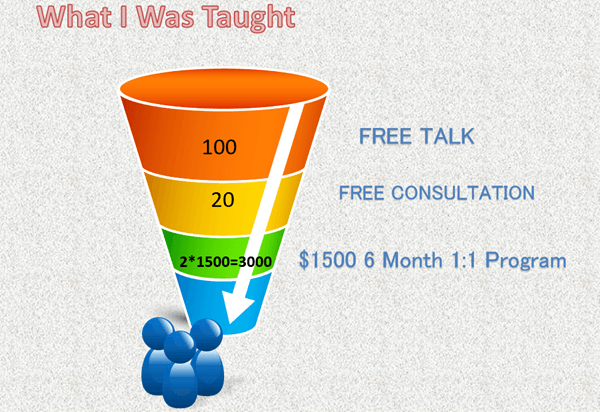 I know lot’s of coaches that are starting out that would love to make $3K but with this model, you would need to do that many public talks EVERY month and get in front of a new batch of 100 people. This would likely lead to burn out and frustration fairly quickly, perhaps you can relate. If you do this right, you will be building a list of people that you can hopefully invite to work with you again at a later time, but without a real system in place most of them fall through the cracks. I was taught to create a newsletter and send it out weekly or monthly, which if great, but not really a marketing plan. Let’s think about a different model now. Instead of offering just a 6-month program, let’s say you have 3 programs ranging from a week up to 3 months. You run a 5-10 day cleanse that you charge $97 for, you run a 6-week group program that you charge $397 for and you have a 3 month 1:1 program that you charge $997 for. These numbers are just for example, you may go higher or lower on any of these but the principle still applies. This time, instead of going out and speaking in front of 100 people, you give away a free email course or some sort of challenge to 100 people that are in your target market. You could do this by public speaking, sharing it on social media, running some sort of advertising campaign, writing amazing content on your website that educates your ideal client, there are quite a few ideas on how to get your “freebie” in the hands of the right people. Now let’s do another little math exercise. Of these 100 people, you sign up 20 for a 5 day cleanse, then upsell 4 people into your 6-week coaching and 2 people into working with you 1:1 for your 3-month program. That comes out to $5,472 from the same 100 people. I have run into tons of coaches that have done some of the beginning stages of this process, like setting up a few programs at different price points, but never got the MOST important piece of making this into a reality. You really need a solid system in place to make this work. 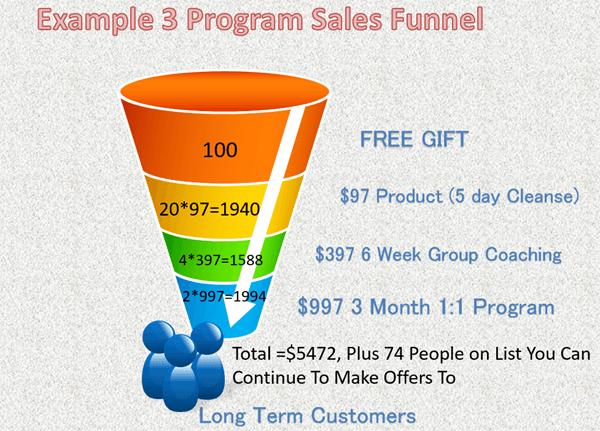 If you just give away your free gift, send 1 or 2 emails offering your $97 program and then try to upsell people right away on the landing page, you likely haven’t seen numbers anything like this. This is the model lots of people teach. Give away your free gift, then on the thank you page offer some program that is super valuable but very inexpensive. Then the people that buy that, upsell them to something else, etc., etc. 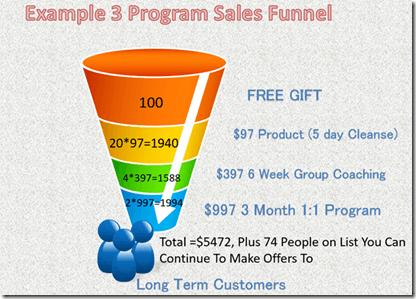 While this also is a very valid business model, the numbers go down dramatically, so you might be able to sign up 10 people to your 5-day program, and maybe 1 each to your 6 and 3-month programs. This would be around $2,364 using the numbers from our previous example. This is still a better result than the original example and if it is all well systematized and marketed it can be a very profitable business model. This kind of business runs on very large numbers of new leads coming into your funnel on a continual basis. This is not necessarily a problem, but personally, I would rather aim for the results in the second example and to pull that off takes a much different approach. So what is the secret to getting results more like the second example? For that, you will have to stay tuned until next week. It’s actually not really a secret, but there are a couple of things that MUST be in place to make this become a reality. I will probably break this down over the course of two separate weeks so this doesn’t turn into a novel for you. I try to keep these posts to around a thousand words so you can read it in 1 sitting. I am doing something extra special this month. 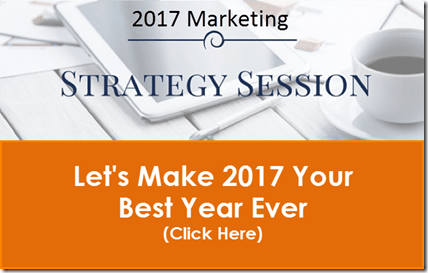 I am booking 2017 Marketing Strategy Sessions over the course of the next 2 weeks where I can help you work out what kind of marketing funnel you would like to have in your business…and yes, if you want to actually make health coaching a career, you really need something like this in place. If you would like to book one of these, and there are limited spots available, just Click HERE! 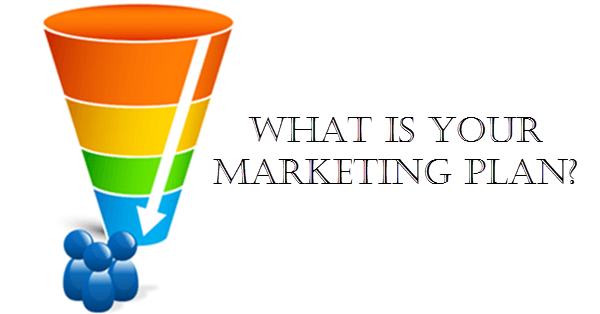 What are you really selling with your marketing?